TIP: Dishes made with dried pumpkin slices are very chewy. TIP: Grind the rice for a thick broth. TIP: Crush the garlic not to destroy its nutrients. TIP: Do not put too much soy sauce. TIP: Braise the ingredients for about 10 minutes. 1. Drain the dried pumpkin slices after soaking them in water. 2. Put the dried pumpkin slices together with perilla powder and rice, and braise them thoroughly. Rich in vitamins A and D, Pumpkins help boost the level of immunity and prevent osteoporosis. 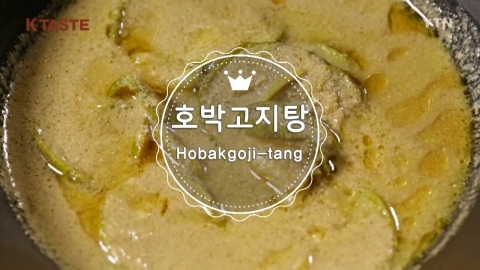 Here comes Hobakgoji-tang (Dried Pumpkin Soup) which helps you fend off the biting cold.